East India is a station on Docklands Light Railway (DLR) in east London. It takes its name from the nearby former East India Docks of the Port of London, where ships trading with the Indian subcontinent used to dock. It is on the Beckton and Woolwich Arsenal branches of the DLR, and is in Travelcard Zones 2 and 3. It opened, with the Beckton Branch, on 28 March 1994. The Greenwich Meridian line crosses the DLR just to the east of the platforms, and a small trackside sign indicates this. East India station was originally to be named Brunswick Wharf and this name was shown on the 1994 'all projections' map. 'Brunswick' is now a code destination used to indicate that a train in the depot has been cleaned. In February 2001 an episode of the ITV series The Bill featured DLR trains with 'Brunswick' as a dummy destination for filming purposes. Here's the our members favorite photos of "Metro Stations near London Borough of Tower Hamlets". 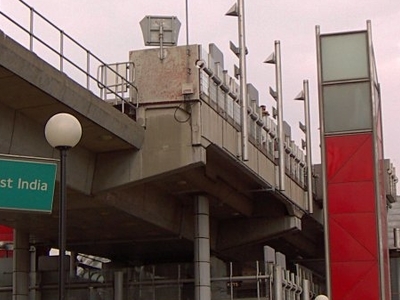 Upload your photo of East India DLR Station!